The Green line has now secured funding to commence building the $4.6 billion, 28 station, 46 km line, which includes a short subway under downtown Calgary, which will have three stations of which one is already built. By comparison, the proposed 6 km. Broadway subway to Arbutus will cost $3.5 billion. I wonder which set of taxpayers are getting the better deal! The Green Line would be a massive public transit line that would stretch 46 kilometres across 28 stations from 16th Avenue North to Seton in the city’s southeast. “This is really a big day for Calgary,” Notley said Wednesday in downtown Calgary. She presented the funding with Mayor Naheed Nenshi and Finance Minister Joe Ceci at 10th Avenue and Macleod Trail S.E., where work is being done to prepare for Green Line construction. The federal government previously committed $1.53 billion to this first stage, which runs from 16th Avenue North to 126th Avenue S.E. Work is expected to begin in early 2020. On Wednesday, the province signed an agreement with the City of Calgary that secures both promised investments, Notley said. The first segment is scheduled to open in 2026, and is expected to cost $4.65 billion for capital construction, according to the city’s website. The funding comes through Alberta’s Climate Leadership Plan, she said. Revenue from the carbon levy is being used through that plan to fund projects that reduce greenhouse gas emissions. This project will improve transit services, which will in turn put more people on trains instead of cars, Notley said. “The Green Line is the biggest transit project in the history of Calgary. It will transform the way Calgarians move around the city. It will generate enormous social and economic benefits for generations to come,” Notley said. She also estimated the construction would generate thousands of jobs and spark private development along the line. 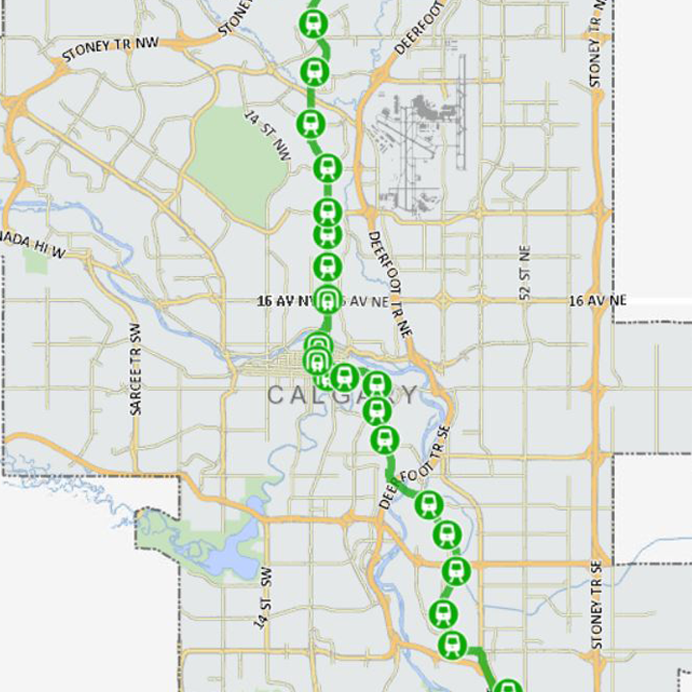 Nenshi said the Green Line, when complete, will double Calgary’s current light-rail network and move more than 60,000 people daily. “Now that this agreement is signed, it means we can move forward,” the mayor said. In a tweet after the funding announcement, United Conservative Party Leader Jason Kenney expressed his support for the project and suggested it would go ahead under a conservative government. In the past, he has questioned the source of funding for the Climate Leadership projects. “I reject the premise that the carbon tax is funding those projects,” Kenney recently told CBC. He promised to cut the tax if elected in this year’s provincial election. Notley, in turn, said that if the carbon levy were cancelled, the Green Line would be cancelled. According to the province’s fixed-date election legislation, the next election must be held sometime between March 1 and May 31, 2019. At the Green Line announcement, Notley said contract language can be tightened to secure funding, should there be a change in government. However, she said that if Kenney were elected and wanted to change the funding, he could by passing legislation. “If they cancel the Climate Leadership Plan … the many, many programs that are funded out of it will disappear,” Notley said, before gesturing to the nearby transit construction. Nenshi noted preparatory construction had already begun and the procurement process would get underway immediately. “This project’s getting built. There are holes in the ground, there will be more holes in the ground,” Nenshi told reporters. Good news for public transit in Calgary. Zwei replies: Which includes a 4 km subway and 70 new low floor trams, which may account up to $3 billion of the price tag. The tunnel is about $1.95 Billion for 4.2 km. The reason for the stunning cost, the depth of it on the north side of the Bow River. This is the reason there is only one station at 16th Ave on the north side. Coming from south to north, the tunnel maybe one of the, if not the deepest transit tunnel in North America by the time the it completes its northbound trip under the Bow River. It then begins a long climb up as well as north towards the Tunnel Portal around 24th Ave. North. I find it interesting that, when investigating options for the Green Line to cross downtown Calgary (Just like Ottawa), the public quickly and almost unanimously dismissed the above grade concrete structure options (which is what Vancouver does mainly with the Skytrain) as ugly, dangerous and unpopular way to block out urgently needed winter sunlight. It’s even more interesting considering that Calgary, has the second largest system in the world of above grade pedestrian access bridges to many downtown buildings, known as the +15 System (15 feet high).